In many ways, the heart of any organization is its data center. This nexus of powerful computer hardware guides all the network functions of an organization, collects and stores a vast amount of data, and provides secure access at lightning speeds. Without the information contained in its data center, an organization would quickly find itself adrift. Because your organization depends on its data center for the information necessary to run all daily processes, regular data center maintenance is an absolute must. Comprehensive data center maintenance consists of several elements, each one essential for the proper function of a data center. You will need to work with a company that specializes in providing these services to organizations like yours. Expert knowledge is required to make sure that a data center is in top working order. Each part of the center will have to be analyzed carefully to determine its functionality. As old hardware components get worn out or become obsolete, technicians will have to replace them. And perhaps most importantly, your data center’s power needs will have to be regularly assessed. Data center power management is one of the most important maintenance tasks that an assessment team will perform. The electrical supply source that powers your data center is responsible for keeping your data center operating the way you need it to. Even though people usually think of their data center as being the most important part of an organization, it is the power supply that keeps that center in operation. If power were to be suddenly lost, all the data your organization relies on could be instantly lost. However, with the right power management practices, you won’t have to worry about this happening. 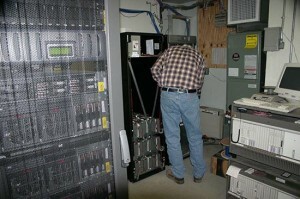 In fact, a data center maintenance company can provide you with many options regarding backup and auxiliary power systems. Implementing a power management program in your organization is easy with the right resources. Any company that specializes in providing data center maintenance and design services can create management protocols that are tailored to meet the unique needs of your organization. A thorough power use assessment can be conducted. That information can be used to create a battery power system backup in case the primary power source your data center relies on is disabled. Other backup systems are also available, depending on the power needs of your particular data center. You can talk over these options with your maintenance team. One of the best ways to ensure that your organization’s data center is receiving adequate power is by scheduling regular maintenance checks. Qualified data center technicians will visit your data center in person to assess the matrix and run the network through diagnostic tests. The information gathered by these regular assessments will provide you with valuable insight into the effectiveness of your current power management practices. If existing management protocols are not providing your data center with the power necessary to run at peak efficiency, then your data center consultants can assist you in revising your power management practices. You should make the effort to schedule regular data center maintenance checks. Even though the hardware components that make up a data center are durable, reliable, and built to last, the information stored in the center is too valuable to risk. Don’t gamble that a problem won’t ever develop. Regular maintenance should be performed on an annual or semi-annual basis. Keep your data center’s power source in good shape! This entry was posted in data center maintenance and tagged data center maintenance, data center maintenance company. Bookmark the permalink.